I popped along to the Landscape Photographer of the Year 2013 Exhibition at the National Theatre on Saturday. It was great to see the exhibition space so busy and such a varying range of people enjoying the images. It was lovely to see so many youngsters there, clutching cameras and clearly making a day of it. Naturally there was a strong International presence too and the assembled images are a wonderful advertisement for the breadth of vistas available throughout the British Isles. As usual the standard of the chosen images was very high indeed. I should have probably looked to see if there was an audio commentary available from the judges as I think it is important to understand how and why certain images were picked. With most it is obvious. There were guided tours with Charlie Waite which would have been fantastic but alas I couldn’t make these due to pre-planned shoots. I have to say that as subjective as art is, there was very little in the way of head shaking as we walked around. The quality was very apparent in all of the winning images. As ever I feel it is very much about getting a range of factors to blend perfectly, to capture a moment in time where the landscape, the atmospheric conditions and the light harmonise perfectly. These are usually fleeting seconds, these moments of time are often fortunate but fortune favours those who place themselves in the right position at the right time. That is half the battle. As landscape photographers we know of the countless times that the conditions have not quite aligned, or when what looked to be magical had in the blink of an eye escaped. I always think there is a photograph to be made but it might not be that showstopper that is good enough to be called the ‘best’. 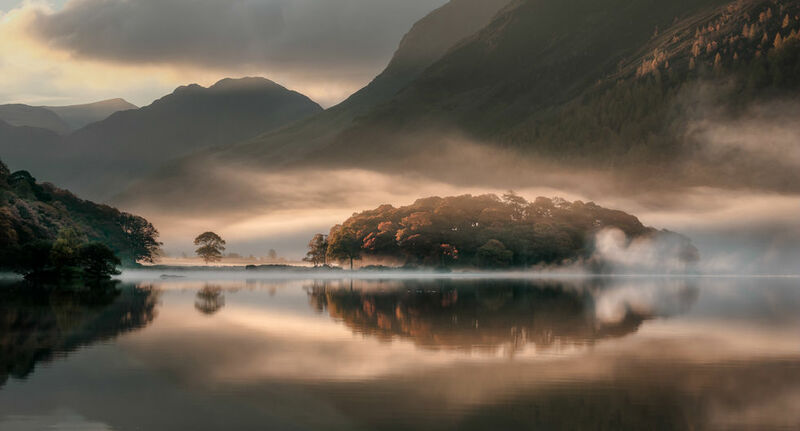 Many congratulations to Tony Bennett whose winning Image ‘Mist and Reflections’ taken at Crummock Water in the Lake District certainly captured one of those fleeting magical moments beautifully. The swooping peaks and length of the range create such scale and depth framing the trees. The glassy stillness of the water, the ethereal mists and the early soft warm light on those trees all harmonise wonderfully, to create a very worthy winning image. Please check out Tony’s website fore more of his great work. I’d imagine that superb phone he received will spur him on to produce many more exciting images. We thought it a little odd that the winning image was at the beginning of the exhibition but a little tucked away around the corner from the main body of work. I would have preferred to have seen it displayed at the heart of the exhibition. I imagine the idea was for it to be the first and last thing you see on entering. I’m glad I made the effort to drop in, as seeing this quality of work always quickens the step and motivates me to improve my craft. I look forward to picking up the book shortly to add to my growing collection. The books are a rich source of inspiration and feature some excellent images. I’ll continue to work hard on my Landscapes and maybe one day soon I’ll see some of my own work on the walls of the exhibition and hell maybe I’ll get a call from Charlie. This entry was posted in Photo Trips, Product Review and tagged charlie waite, landscape photographer of the year 2013, landscape photography, LPOTY, national theatre, rich clark, rich clark images, southbank, take a view, tony bennett, tunbridge wells photographer.